New Maruti Swift vs Dzire vs Ignis: Who should buy what! Maruti Suzuki India Ltd, the largest car manufacturer in India, recently took the entire car market by quite a storm with the launch of the all-new Swift hatchback. On sale at a starting price of Rs 4.99 lakh, and going all the way to Rs 8.29 lakh for the top-end model, the new Swift offers a variant and a trim to suit all needs. However, a wide range of prices also puts the Swift at loggerheads with two of its own siblings – the Dzire and the Ignis. While none of these are direct competitors of the other two, there’s a definite price overlap between the trio. So, which one of these should you buy? Let’s find out in new Maruti Swift vs Dzire vs Ignis comparison here. Prices of these three are mostly similar. 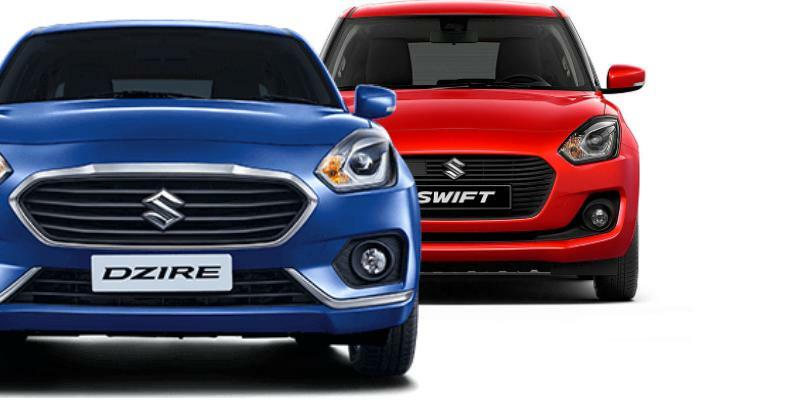 Prices of the new Swift start at Rs 4.99 lakh, whereas the prices of the Dzire start at Rs 5.56 lakh. On the other hand, the Ignis is up to Rs 30,000 cheaper than the Swift. Another major similarity lies in the specifications of these cars. All three cars here come with the same set of petrol and diesel engines. The petrol motor in question here is a 1.2-litre K-series motor that has won plenty of accolades for its refinement and frugality. The Petrol engine outputs a maximum power of 81.80 bhp along with a peak torque of 113 Nm. The Diesel engine, on the other hand, produces a maximum power of 74 bhp and a peak torque of 190 Nm. Moreover, all the cars here offer a 5-speed manual transmission as standard and an optional 5-speed AMT on both the Petrol and Diesel engine variants. The three Maruti cars we have here are based on the same new, lightweight generation HEARTECT platform that made its debut on the Baleno. The new Swift, Ignis, and Dzire also offer same levels of equipment. All the three cars here offer bits like a touchscreen infotainment that supports Apple CarPlay and Android Auto, a push-button start, automatic climate control, DRL LEDs, and projector headlamps. The Dzire also offers rear aircon vents, but the new Swift and the Ignis offer many customization options to jazz up the interior and exterior styling. A major difference between these three cars lies in their design. The Ignis is for you if you want something different to stand-out among a crowd of millions of compact sedans and hatchbacks that dot our roads. The Ignis will definitely appeal the young and the fashion-conscious. It offers many in-house customization options to make sure your Ignis looks nothing like any other Ignis out there. The new Swift is just the right mix of funkiness and sportiness. We are just too happy with the way the design of this hatchback has evolved over the last few generations. The latest Swift looks modern and very fashionable whilst retaining the DNA of India’s first-generation Swift. However, keep in mind that the new Swift will soon become a very common sight on the road and hence, lose some of its charms. The new Dzire gets the same DNA as the new Swift. It looks modern and sufficiently sporty, too. However, it’s the first time that a generation of the Swift and the Dzire has been designed in a parallel fashion. Hence, you don’t get the quirkiness associated with the design of the earlier Swifts. While the interior of the Dzire and the new Swift are somewhat similar, the Ignis has a different-looking cabin. 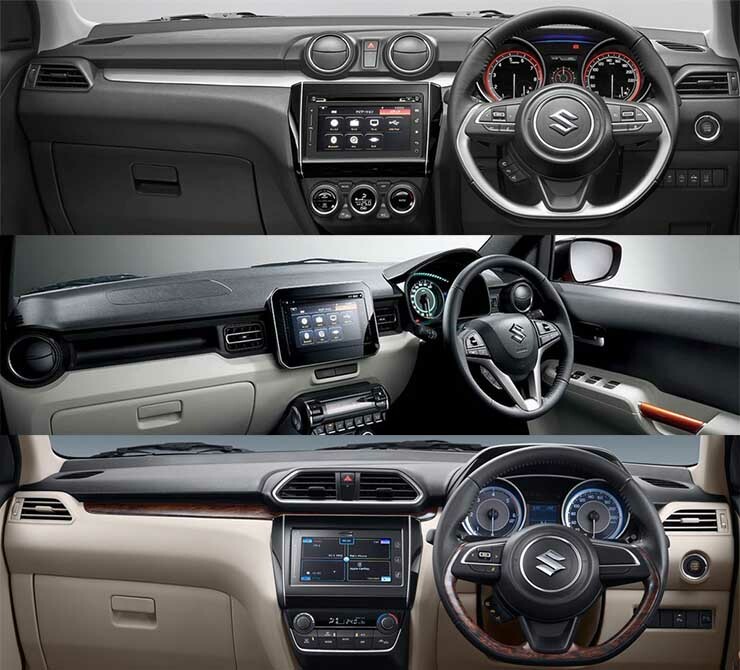 Even between the Swift and the Dzire, the two cars get different color themes and slight variations in the dashboard. The Swift, true to its sporty exterior, gets an all-black interior to keep up the sportiness quotient. Also, the central aircon vents on the dashboard are round in shape. In comparison, the Dzire gets rectangular central air vents and a beige interior to compliment the slightly more premium feel of a sedan. The Ignis, on the other hand, gets a cabin that complements the crossover-ish exterior. You get a flatter dashboard with a dashboard-mounted handlebar for the passenger. You also get exterior color-coordinated interior trims. In terms of space, the Ignis offers the least real estate. All the cars here drive in totally different ways. You can pick up the Ignis if you’ve been looking for a go-kart like driving experience. It offers sufficiently powerful engines and predictable road handling. The Ignis is pretty agile and you also benefit from a commanding view of the road thru a high seating position. The Dzire also drives pretty well. It feels pretty nimble, which is mainly due to the lightweight platform and the re-tuned motors. The steering is pretty light but never feels disconnected from the wheels. You also get powerful set of brakes. The ride is pretty comfortable as the suspension is set slightly towards the softer side. The Swift, in spite of sharing in plenty with the Dzire, offers a sportier driving experience. Its suspension isn’t as softly-sprung and a shorter overall length makes it even easier to make your way through the traffic. The steering is sufficiently light but isn’t lifeless. Here, too, the brakes are pretty powerful. While the three Maruti cars here have a lot in common, they target a different set of buyers. The Dzire offers a good mix of performance, space, and features. You get a comfortable and an upmarket cabin and the same engines as the Swift. The Dzire is for all those who want the biggest car for their money – you get a larger boot and some extra features like the rear aircon vents. The new Swift will impress all those who are somewhat passionate about driving and want a small car that is modern, sporty, and sufficiently feature-laden. The new Swift is almost a hoot to drive and comes loaded to the brim with many comfort- and convenience-enhancing features. Want a car that offers many crossover-traits and still looks fashionable enough? The Ignis is the one for you! It offers many customization levels and the high ground clearance makes it more practical than the other two cars here.